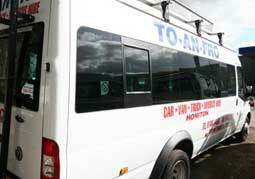 To-An-Fro offer vehicle hire, and are specialists in minibus hire, Exeter. With a wide range of vehicles To-An-Fro can help transport people and items. To-An Fro's Minibus hire for Exeter can give you a range of different minibus sizes with buses available to seat up to 17 people. As well as minibuses To-An-Fro offer people carriers including a Renault Traffic, which can hold 9 people, and a Hyundai i800, which can hold 8 individuals. 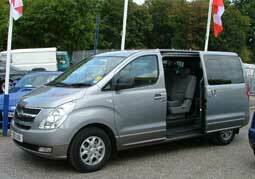 Minibuses are perfect for a range of different occasions, including for weddings and family trips out. Van hire is also available from To-An-Fro with a large selection of different vans, including luton vans with a size of 13.3 ft and a Transit jumbo with a size of 12.8 ft. As well as larger vans we can also supply you with a range of small vans. In addition to the minibus hire and van hire for Exeter To-An-Fro can also help if you are looking for lorry hire. To-An-Fro's lorry hire is perfect for if you are looking to move house or you are moving your business to a new premises. If you want to know more about driving requirements for Minibus Hire Exeter To-An-Fro have a list of different rules that must be followed.